We would like to offer a warm welcome and a very happy new year to all of our existing customers, and to anyone visiting us for the first time. You can always be sure of friendly helpful service at Kimber-Allen UK. PLEASE USE THIS ADDRESS AS OUR OLD FREESERVE ADDRESS IS BEING DISCONTINUED. The picture, above right, shows a console completely fitted out using Kimber-Allen UK products, including Drawstop Solenoids and Engraved Drawstop Knobs, Engraved Department and Pedal Piston Labels, Keyboards. Thumb Pistons, Toe Pistons and Swell Pedals. Unseen in the picture are Pedal Jacks and complete key actions. PLEASE NOTE THAT WE NOW CLOSE AT 1.00 PM ON FRIDAY AFTERNOONS. NEW PRICE LIST 2016 Our current price list is dated January 1st 2016 and this is available in PDF format to be emailed to you. You can also download or view our catalogue in PDF format direct from this site on the "KA CONTACT PAGE". If required you can still request a hard copy to be sent by post. We are happy to accept payment by credit card, please contact us for details. 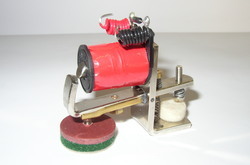 K-A Electro-mechanical Organ products have been distributed in the UK, and world wide, for many years. 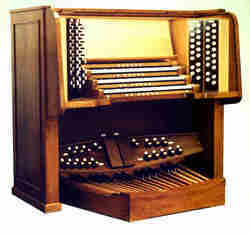 While most organ builders and enthusiasts will be familiar with our range, the origins and compatibility of which go back to the 1930's, we suggest that you use this site, and our readily available catalogue, to keep up to date with our current range of products, as we are constantly striving to update and improve existing items while introducing new products at every opportunity.